The violins of the Tehachapi Strings Orchestra perform Friday night. The Tehachapi Junior Strings performs Friday night. 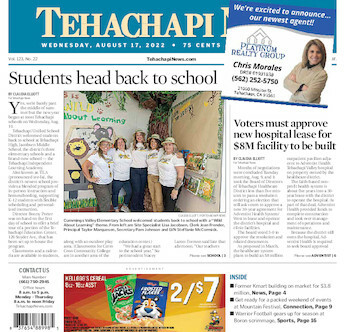 The Tehachapi Strings Orchestra performs Friday night. Concertmaster/Conductor Gayel Pitchford welcomes nearly 75 audience members to the Tehachapi Strings Orchestra, and the Junior Strings musicians who were in performance in Tehachapi on Friday night. Tehachapi music teacher Gayel Pitchford. An impromptu curtain call by some of the Friday night string performers includes, from left to right, Sue Pollard, Joy Robb, Sara Frias, Emily Hamilton, Natalie Whiteside, Everett Hamilton, Joshua Pong, Penn Whiteside and Eathan Yang.